IknowIknow. I went off script. NEVER go off script. 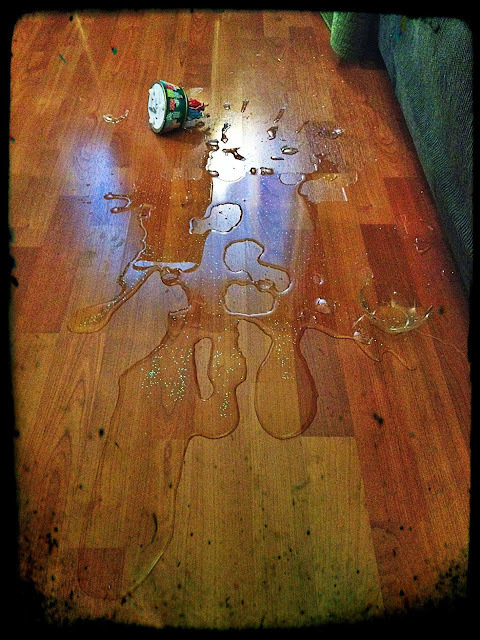 And even as I was doing it… a little voice in my head said, "Don't do it, don't do it." To which a slightly louder voice in my head, which apparently has lost all common sense said, "Oh, it's okay. Just ask her to write her name. She won't mind." Shut. Up. Stupid louder voice!!! You were wrong. The reading had gone remarkably well. We checked off "read". Then it was time to draw and as we opened up the brand new notebook, I noticed that her name wasn't on it yet, so I foolishly asked if she'd like to write her name. Not told. Not demanded. Just, "Would you like to write your name?" in my sweetest sing song voice. Well, it was a big, resounding NO. And not just a normal no, but a run around the house and knock over everything she sees in sight, no. Yelling at the exact frequency that hurts my sinusitis filled ears and makes me want to run away. But I didn't. I stood there with my back to her, listening to her yell and knock things over. I was counting to 60 and was about to ask her to come back to the table. The sound of the destruction of her beloved princess snow globe that she'd received only a week before at a Christmas party. Sparkly water and glass everywhere. 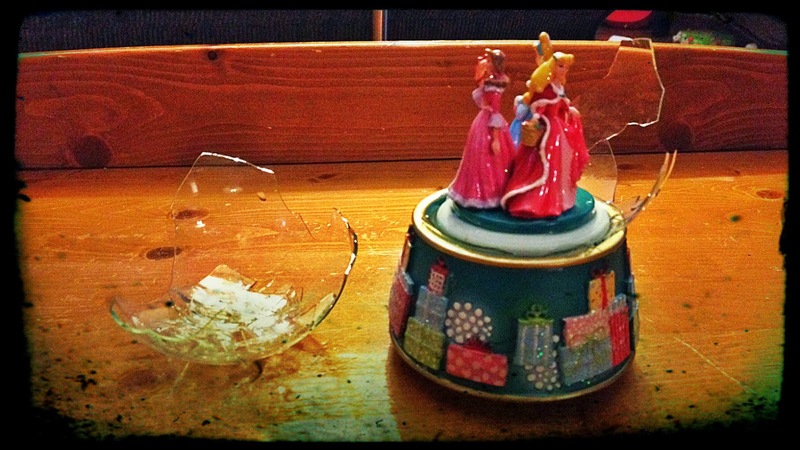 Three little princesses ripped out of their shimmery, snowy wonderland. And mommy left to clean up the mess. The lesson? Well, I have two take homes today. One: Even if it's hers, if it's breakable, keep it up higher than she can reach in a rage. And two: Never go off script. Just don't. Seriously. Stick to the script.